When Hurricane Katrina hit, Cabot immediately sent food to New Orleans, which local chef John Folse used to make 26,000 meals for the needy. As a cooperative owned by farming families, Cabot Creamery is “all about community and building long-term relationships,” explains PR manager Bob Schiers. When Hurricane Katrina hit, Cabot immediately sent food to New Orleans, which local chef John Folse used to make 26,000 meals for the needy. Last year, five years after Katrina, Cabot asked Deveney Communication to help create a campaign to benefit New Orleans and draw national attention to the ongoing housing problem. The campaign centered on an event where Folse would attempt a Guinness World Record for the largest macaroni and cheese. Proceeds benefited New Orleans Area Habitat for Humanity (NOAHH) and two other local nonprofits. The event was held September 23 (during the National Association of Housing Cooperatives' annual conference) on Fulton Square, which agency president John Deveney explains is an area that attracts both locals and visitors. Cabot commissioned and bought 1,500 ceramic bowls from The Magnolia School, a nonprofit serving mentally handicapped adults. The macaroni and cheese was sold in the bowls to raise money for NOAHH. Leftovers were donated to Southeastern Louisiana Second Harvest Food Bank. Media relations, social media engagement, and grassroots outreach drove awareness. The team enlisted local companies to donate services for the event and about 25 community influencers to serve the dish. Outreach to businesses surrounding the venue was conducted in person and via email. The team also partnered with Rouses grocery stores to promote the event and sell tickets. Local media in Louisiana, Vermont, and national outlets were targeted. Information and photos were posted on Cabot's website, Twitter, and Facebook pages, as well as on the nonprofits' social media channels. 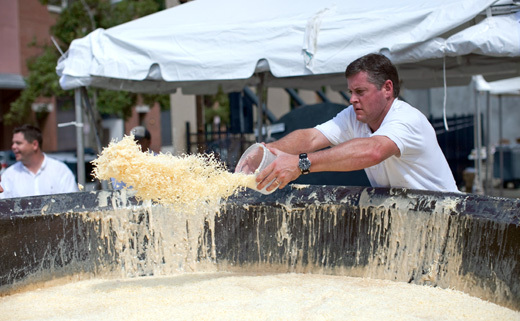 Weighing in at 2,469 pounds, Folse's macaroni and cheese easily broke the former world record of 444 pounds. The ceramic bowls sold out within two hours. Nearly $21,000 total was raised for NOAHH. The Magnolia School received $6,000 from Cabot for the bowls. The food bank got about 600 pounds of leftovers. Schiers notes the campaign helped initiate a new revenue source for The Magnolia School, which now sells bowls to the public. The campaign garnered 8.5 million media impressions in local and national outlets, including USA Today. Schiers adds that Rouses is expanding its line of Cabot products. The team is planning a 2012 event to tie communities together through volunteerism.